Pros: If intellectual depth is what you're looking for in an anime, you'd be hard pressed to beat this without something like Serial Experiments Lain. -Deep! Deeper! More Depth Required! I can't think of the last time anime tried to be so...down to earth. I mean, sure, everything's off the hinge surreal because Parasites but still it is a lot more grounded than anything that has been around lately. This show has a mission statement to crack open the human psyche and just keep digging. -The animation is worthy of note, to me anyway, in how unique it was for the parasites. Not much to say on this point other than that, I'm not really the one to talk to about graphical fidelity. -Actions worthy of mention. Ultimately, it's not what I was here for...strangely enough, given the fast start the show had, but when a fight does break out it is always the center of my attention, because it is always resolved practically. No plot armor here. -I just know that somewhere out there, is someone who has taken great offense that anime would try to be at all psychological, but that's not what I'm talking about. For a lot of people, anime is a great way to unwind, to kick back and just mindlessly enjoy something fun. Personally, this anime still floats my boat on this point, but I like to think I'm at least kind of eccentric that brooding is a relaxing unwinding state. -The ending is a little abrupt. At the same time, it feels like the kind of thing that may very well have happened in the original source material. There's more things to see and for the story to continue on with, but all relevant immediate plot points have been resolved in a very practical manner. It still is way too neatly cut for my tastes, but that's likely because I was really into this show. My Opinion: This was an awesome show. Hands down, I loved it from start to finish. I may not have made any posts about it, but that was only because I was afraid of fangasm'ing all over EvilCat's blog. This show is just absurdly philosophical. You barely get a single episode to go by without Migi or Shinichi brooding on some question of humanity or morality. That said, there is always going to be that guy. You know, the never-happy-enough kook that will point out that "OH WELL NOW, the show hasn't REALLY talked about anything THAT deep! It could have talked about Philosophical Point A or Philosophical Point B, or ..." blah-dy blah blah nyeh. Whatever. They can go stuff it for all I care... okay I just got a bit strawman-fallacy'ish there. What I mean to say is, even if this wasn't taken in the context of it being an anime, and was just standing on its own, I feel the show would still be a good piece of deeper narrative than what you popularly get today. No one gets plot armor, things happen practically, and people react reasonably within expectations. Impartial Judgement: Not for Everyone. Not by a long shot. 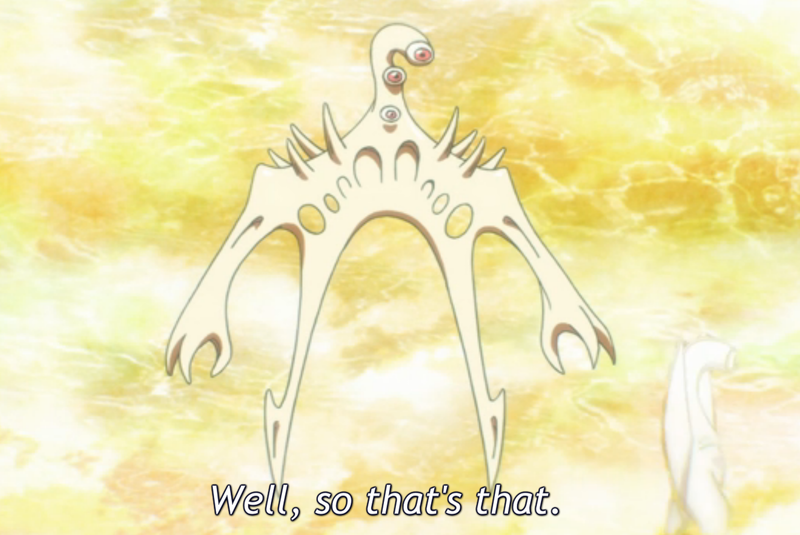 I wouldn't be surprised if some of the things Migi and Shinichi brood on had never come anywhere close to some peoples worlds of thought. These days, we enjoy more than a little peace and prosperity...in most places. No where is perfect, but there is a bad case of 'The Bubble Worlds' that people sometimes live in, perfectly unaware of the terrible things that happen in the world. Me, I watch 'Criminal Minds' as entertainment, so I'm more than a little biased to enjoying a good moral gray and terrible happenings brooding about humanity and the human experience. If you want a solid deep story with a stable plot, Parasyte is for you. The action decreases in frequency as the show goes on, but interestingly enough gets more intricate in exchange. The plot however, isn't the deepest thing in the world. Unless you count the brooding as part of it, the plot is very face-value as Shinichi's motives for pretty much the entire show, and I suppose that could bug some people. He doesn't have a case of the Shinji's, he grows as a character, it's just very one sided most of the time. Ultimately, I give this a full recommendation for anyone that doesn't feel squeamish around death and questioning humanity and morality. Shows will either get a Recommended tag from my End posts, or not. Just because I wouldn't recommend a show doesn't mean it's bad. That's the part I've always wanted to avoid, inadvertantly labeling a show as 'bad' just because it wasn't something I myself would typically enjoy.